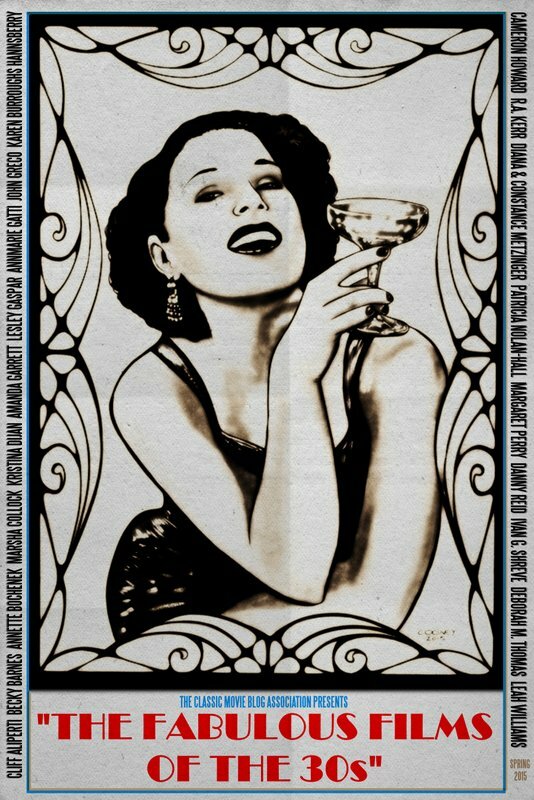 via: https://en.wikipedia.org/wiki/The_Dark_Mirror_(film) Unless otherwise noted, all images are my own. 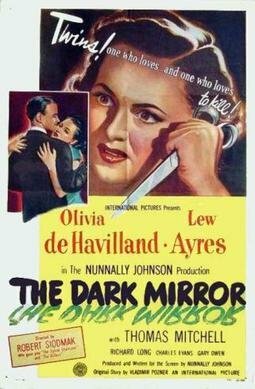 That’s the dramatic tagline that advertised The Dark Mirror (1946), a psychological thriller about twin sisters. It’s one in a series of movies made in the 1940s and 1950s that focused on the growing field of psychology/psychiatry. 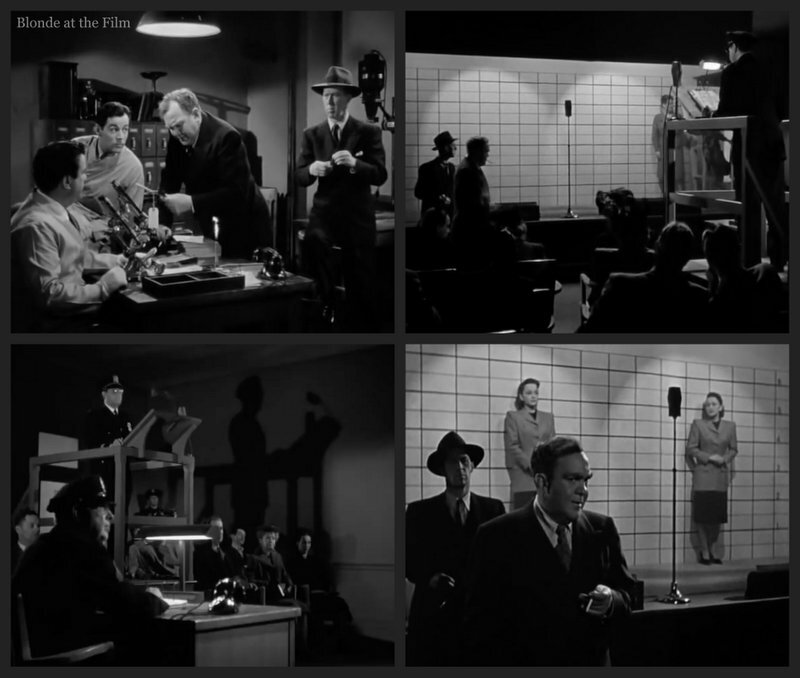 Often intersecting with film noir, movies such as Gaslight (1944), Spellbound (1945), and The Snake Pit (1948) brought mental illness and treatment to theaters in suspenseful, thrilling movies. In fact, most of the The Dark Mirror is about psychology, not the crime itself. The Dark Mirror was based on a short story by Vladimir Pozner that was published in Good Housekeeping in 1945. Nunnally Johnson, a longtime writer, producer, and soon to be director, snapped up the rights and adapted the story for the screen. He also produced the movie as a joint venture between International Pictures, a company founded by Johnson and William Goetz, and Universal Pictures. 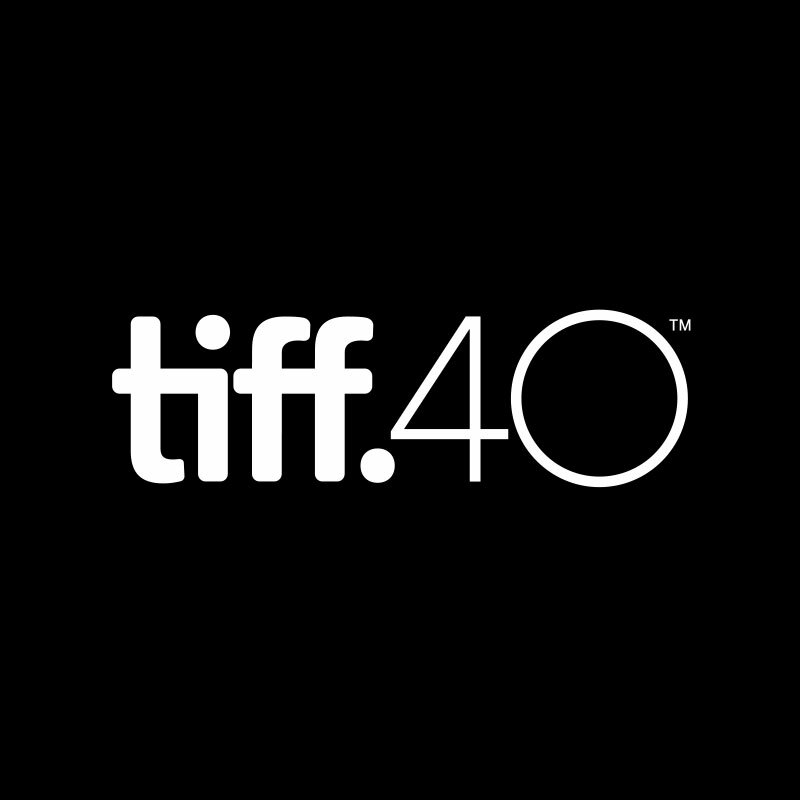 The two had recently merged, and The Dark Mirror was the first movie made under the Universal Pictures-International Pictures banner. 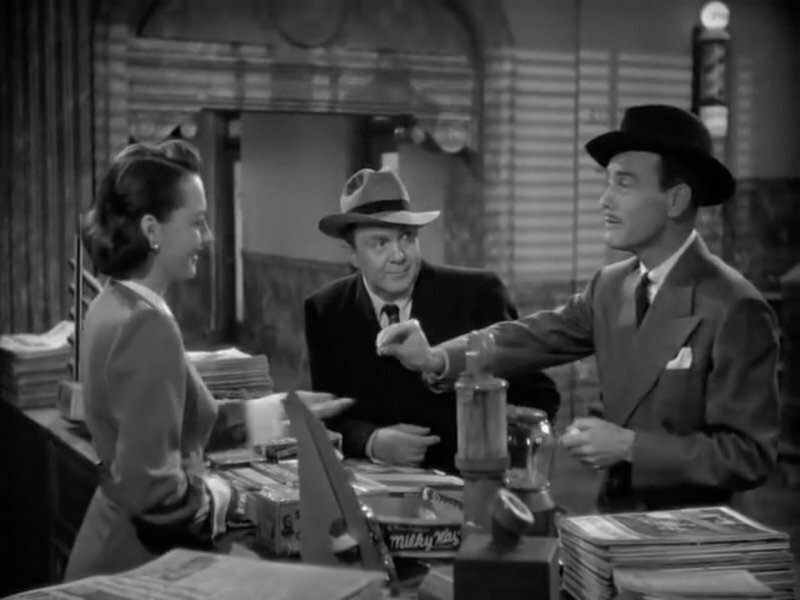 Opposite de Havilland is Lew Ayres as a psychologist and Thomas Mitchell as a no-sensense police detective. Fun fact: the credits appear over Rorschach ink blot tests, and we’ll deal with these famous tests quite a bit later on. This was Lew Ayres’ first movie after a four year absence. After the US entered WWII, Ayres became a conscientious objector and was placed in an internment camp. But he’d actually requested to serve as a non-combat medic, and within about two months of his internment he was reclassified and joined the Army as a medic. He served as an instructor before he asked to be sent to the Pacific as a medic and chaplain’s assistant. All told, he spent three and a half years in the Medical Corps, donated his entire salary to the Red Cross, and was awarded three battle stars. After the war, he considered becoming a chaplain, but returned to movies instead. He was perhaps most famous for his Dr. Kildare films, so it’s fitting that his first appearance on screen after four years away was as a doctor. You may recognize Thomas Mitchell from any number of terrific performances. He was in Stagecoach (1939), Mr. Smith Goes to Washington (1939), Gone with the Wind (1939), (which also starred de Havilland), It’s a Wonderful Life (1946), High Noon (1952), and The Miracle on 34th Street (1955), among many others. Cut to Lieutenant Stevenson (Thomas Mitchell), the detective assigned to the case. He interviews witnesses at his charmingly typical office (note the stenciled door, hard chairs, and excellent shadows). We learn that the victim was Dr. Frank Peralta, and fortunately for the lieutenant, he has two witnesses who saw a woman leave Dr. Peralta’s apartment the night of the murder. 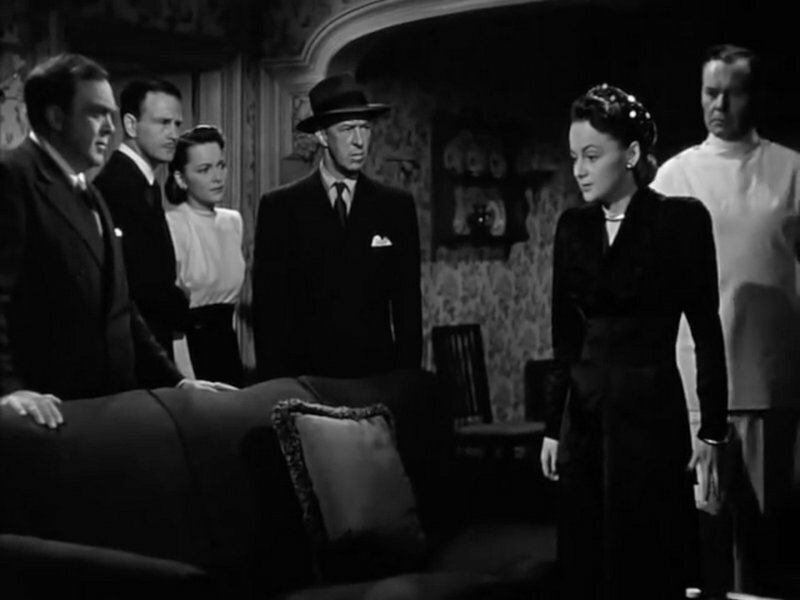 Soon Stevenson has a name for the woman, Theresa “Terry” Collins (Olivia de Havilland). The doctor’s assistant tells him that the doctor was in love with Terry and was planning to propose, so perhaps the murder arose out of a lover’s quarrel? The next morning, the lieutenant takes the two witnesses to Terry’s magazine stand to see if they can confirm it’s the woman they saw. Both are sure it’s her, so the lieutenant begins his interrogation. 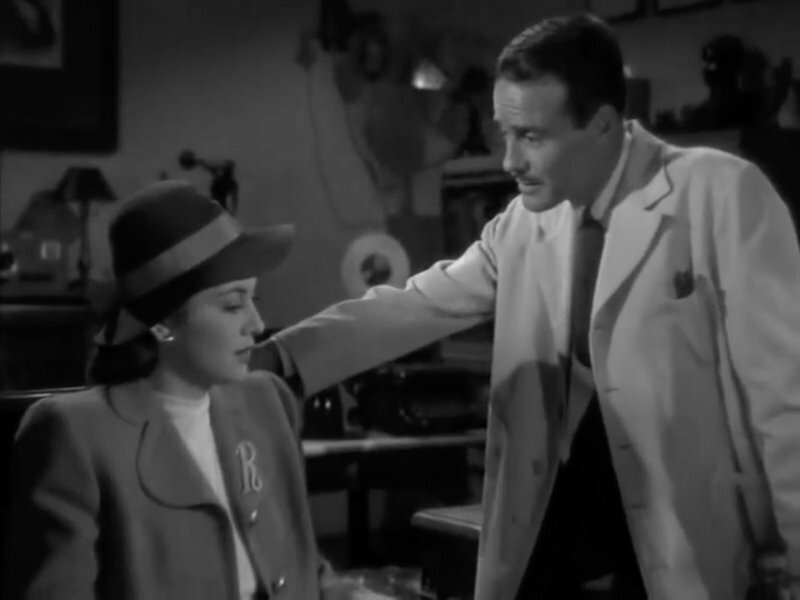 But he is interrupted by Dr. Scott Elliott (Lew Ayres) who stops by for lemon drops and brief flirtation. After this interruption, the lieutenant grills Terry about her whereabouts the previous night. 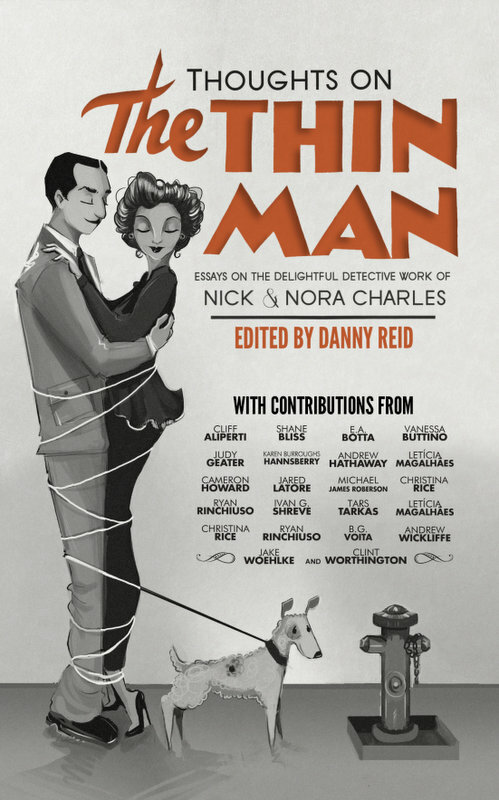 To his dismay, she provides him with a detailed itinerary of her movements along with the names of several friends and acquaintances with whom she interacted, including a policeman and her butcher. But the two witnesses swear they saw her leaving the doctor’s apartment last night, and it was well-known that Dr. Peralta was dating Terry! The lieutenant runs down her alibis and they all check out. So he can’t arrest her. Instead, he drops by her apartment that evening for a chat. And things begin to make a little more sense when Terry’s identical twin sister, Ruth, appears! They even wear the same bathrobes, though with a “T” and an “R” monogram, respectively. Lieutenant Stevenson determines that one of the sisters must be the murderer, but they refuse to admit which one of them has the airtight alibi because they claim the other one stayed at home all night but can’t prove it. So they plan to keep their mouths shut. 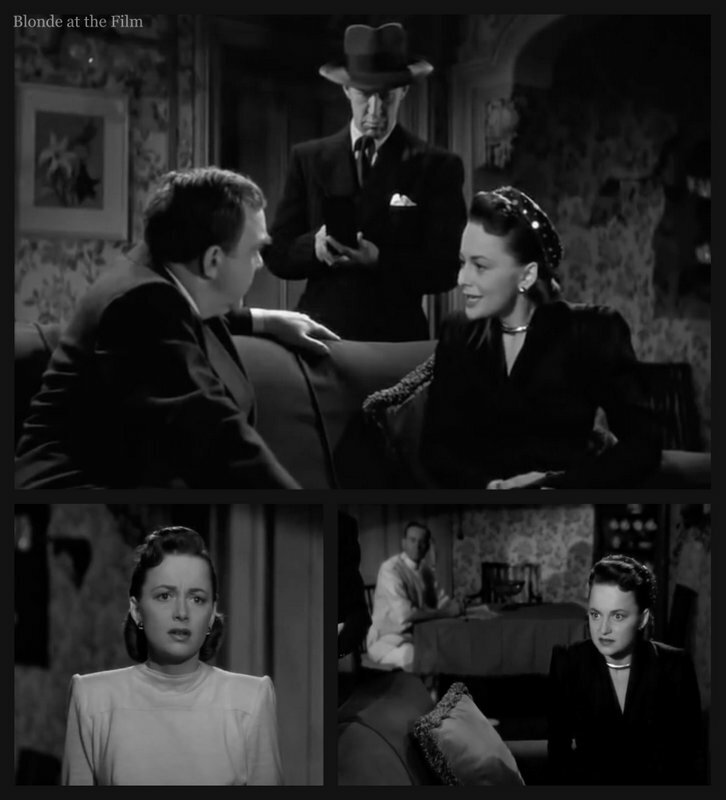 The way de Havilland can appear twice in one shot is beautifully done throughout the movie! There was a stand-in, or “photo double,” but generally the shots in which both “twins” appear together look great. After this frustrating conversation with the twins, the lieutenant rechecks his evidence. There are no fingerprints on the knife, so that’s a dead end, and no other evidence to prove which sister was there. So he brings both sisters in to see if his witnesses can tell them apart. Of course they can’t–the sisters are uncannily alike. Indeed, they often pretend there is just one Collins girl, and they are so similar that no one has figured out that there are two. For example, no one at the magazine stand knew there was a Ruth, which meant that Ruth and Terry could switch off if one of them didn’t want to work that day. The sisters think it’s a harmless prank, but it’s kind of creepy. Even Dr. Peralta didn’t know that his beloved was a twin! Though he did ask Scott (Dr. Elliott) about split personalities shortly before he died because “Terry” sometimes seemed different. Apparently the sisters would switch off on dates, too! Yikes. Anyway, the sister’s strategy of silence works: the DA can’t charge both of them with the murder, but he also can’t pick one without any evidence. And a jury would never convict. So instead the DA gives the sisters a stern talking to about obstruction of justice and accessory to murder, and sends them on their way. Even after the DA drops the case, Lieutenant Stevenson can’t give up. He hates this idea of a “perfect crime,” but he isn’t sure how to determine which sister is the murderer. So he asks Scott, who happens to specialize in the study of twins, if he can learn to tell the women apart and perhaps suss out which one of them is a murderer. Scott has spent his whole career studying the physical and psychological differences in twins, so he can’t resist. He asks the sisters if they will take part in a research study, and they agree, though Ruth is reluctant. And we soon find out why. Once the doctor leaves, Terry admits to Ruth that she did see Dr. Peralta the night he was killed, and he did propose. So why should she kill him, she asks Ruth? And since Ruth can’t imagine that Terry is a killer, she agrees to keep her mouth shut. But she is afraid that the truth about their alibi will come out during Scott’s research. Terry isn’t concerned: she knows she is smarter than the doctor and can pass all of his silly tests. Costume appreciation break: costumes always tell the story, but in this movie they do double duty by helping the audience and the characters tell the twins apart. The ladies always wear exactly the same clothes, but almost always include monograms or name necklaces, as they wear above, as name tags. Irene Sharaff designed the costumes, and though the actual clothes are fairly unremarkable, the name tag elements are very necessary and fun, whether they’re huge “R” or “T” brooches or clunky necklaces. Anyway, Scott invites each sister to visit his office individually several times a week over the next few months. They run through a selection of psychological tests, including the famous inkblots. Although the ink blots are almost cliche at this point, they were still a new and fascinating psychological tool when this movie was made. Dr. Hermann Rorschach created the test in 1921 to diagnose schizophrenia, but it wasn’t until 1939 that the ink blots were used as a more general personality test. 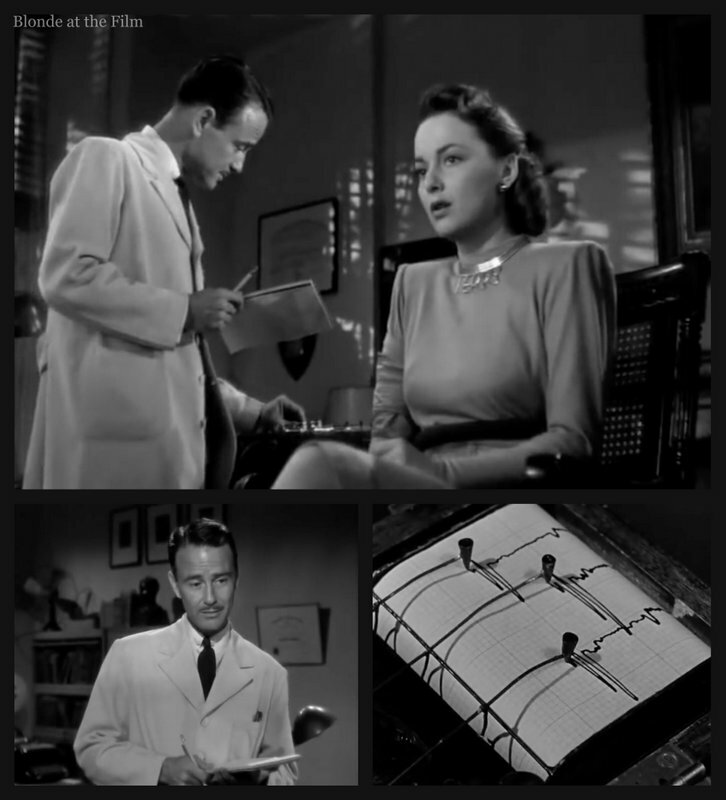 From some very light research into the method, I think that their use in this movie is pretty accurate, down to the rotation of the cards and the score sheet Scott uses to tabulate the results. As Scott learns more and more about the sisters, he falls in love with Ruth even as Terry starts to pursue him. Unfortunately for Terry, this seems to be a pattern. We learn that when the girls were young orphans, a couple wanted to adopt Ruth, but not Terry. As they grew up, men gravitated towards Ruth, too, and even Dr. Peralta preferred Ruth even though he didn’t know it. It was when he was with Terry that he worried about split personalities. Ruth doesn’t know that anything is amiss with her sister, but Scott is convinced that Terry is insane and murdered Dr. Peralta in a rage of jealousy when she realized he loved Ruth and not her. A big tip-off comes during one of Scott’s tests when Terry’s blood pressure spikes every time Ruth’s name is mentioned. When Terry realizes that she isn’t fooling Scott, she starts gaslighting Ruth to think that she is losing her mind. We assume Terry plans to pin Dr. Peralta’s murder on Ruth once she has completely destroyed her sister’s sanity or pushed her to suicide. Poor Ruth never suspects a thing even as Terry gets scarier and scarier. Then Terry sees Scott kissing Ruth outside of their apartment. Scott is one more person who prefers her sister, and she can’t handle it. The next evening, Scott tells the lieutenant that Terry is a “paranoic” and definitely killed Dr. Peralta. The lieutenant is concerned for Ruth’s safety, so Scott promises to tell Ruth that night about her sister. He calls the Collins’ apartment and asks Ruth to come see him later that night. But he was actually talking to Terry pretending to be Ruth! Fortunately, Ruth stops by his office immediately after the phone call, so Scott discovers Terry’s trick. Then he sets a plan in motion to trap the bad sister. His reasoning is insulting and sexist, but here it is: all sisters are rivals because they are similar, so the competition (for men, naturally) between them is much stronger than between other random woman. This jealousy and rivalry is “why sisters can hate each other with such terrifying intensity,” Scott claims. The competition is even more powerful between identical twins because they are that much more alike. This rivalry has taken over and destroyed Terry because she can’t claim that people prefer Ruth because of luck, circumstances, or big differences between them. They are so similar that there are no excuses for why men prefer Ruth other than she is somehow better than Terry. And Terry can’t handle that, so she has slowly but surely gone insane. “Ruth” gets more and more agitated as Scott talks, and she really gets upset when Scott calls her Terry! He tricked her! Then he describes how Dr. Peralta must have confronted Terry about his split personality theory, and when she realized that he preferred Ruth even when he didn’t know Ruth existed, she lost it and killed him. (Which makes Scott’s plan awfully foolish. Terry has already killed one man for confronting her about this!) Terry is about to grab a pair of scissors to stab Scott when the lieutenant calls with horrible news. Ruth has killed herself. The news calms Terry’s homicidal rage, and she and Scott rush to the Collins’ apartment. Terry tells the lieutenant that her sister killed herself because she was “sick” and “twisted inside” and was losing her mind. Terry repeats exactly what Scott told her about herself, but claims it was Ruth who was insane. Ruth’s suicide has given her the perfect out! But then Terry starts rambling about how she is actually Ruth, and that Terry is the one who killed herself because she was so jealous of Ruth and couldn’t handle the guilt over Dr. Peralta’s murder. Terry has snapped. It gets weird. But then guess who walks out of the bedroom? It’s Ruth! The lieutenant played a trick on Scott and Terry to see what would happen, and it worked. Terry is taken away, presumably to a mental institution, and Ruth and Scott embrace. Then he asks her “Why are you so much more beautiful than your sister?” which is about the most inappropriate thing he could ever say. It’s quite the ending. 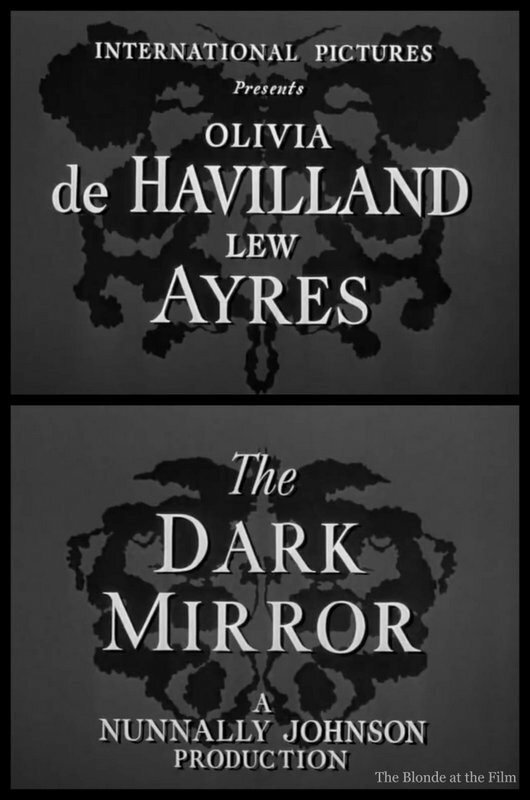 The Dark Mirror was in production in February through late March 1946, and premiered on October 16. The movie received mostly positive reviews, and the papers heaped praise on the screenplay, direction, score, and photography, as well as the lead actors. Edwin Schallert of The Los Angeles Times wrote that the film “gives amazing scope to the acting ability of Olivia de Havilland. Simultaneously it misses little in fascination, because it offers suspense and the novelty of the treatment.” The “psychoanalysis it goes in for is exceptionally interesting,” and the performances by Ayres and Mitchell, as well as the direction, production, and screenplay, are also deserving of praise. Nunnally Johnson’s screenplay and production are almost impeccable, breathing simplicity and warmth at every turn into what might have been pretty academic material. And Robert Siodmak’s talent for directing this sort of thing is imprinted throughout. 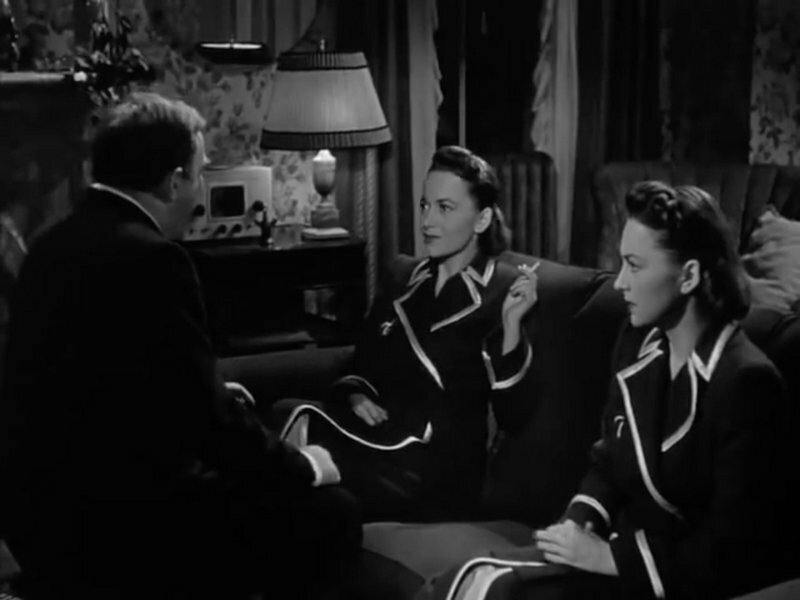 The review adds that “Miss de Havilland comes through with one of her top performances.” It also mentions Irene Sharaff’s costumes and the “subtle use of jewelry to identify the twins.” What’s subtle about huge monogram pins or name necklaces? I agree that the costumes do a good job, but subtle is not a word I would use. Audiences liked the movie, too, and it came in 46th in Variety’s list of 60 top grossing films of 1946. (Bells of St. Mary’s was #1). 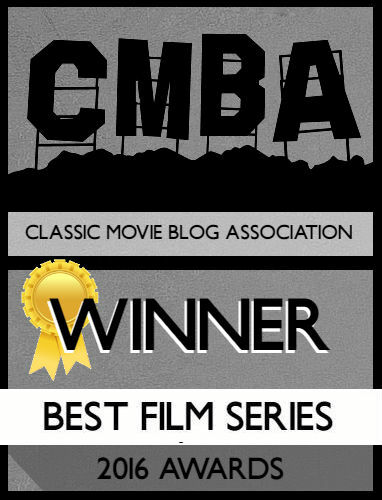 Vladimir Pozner’s story, “The Dark Mirror” was nominated for Best Story at the Academy Awards, though it lost to “Vacation from Marriage” by Clemence Dane, which was adapted into a British movie (released as Perfect Strangers in the UK) starring Robert Donat and Deborah Kerr. As I already mentioned, Olivia de Havilland picked up a Best Actress Oscar, though it was for her performance in To Each His Own. In 1948, the Screen Guild Theater produced a radio version of The Dark Mirror starring Lew Ayres and Loretta Young. You can listen to it here. 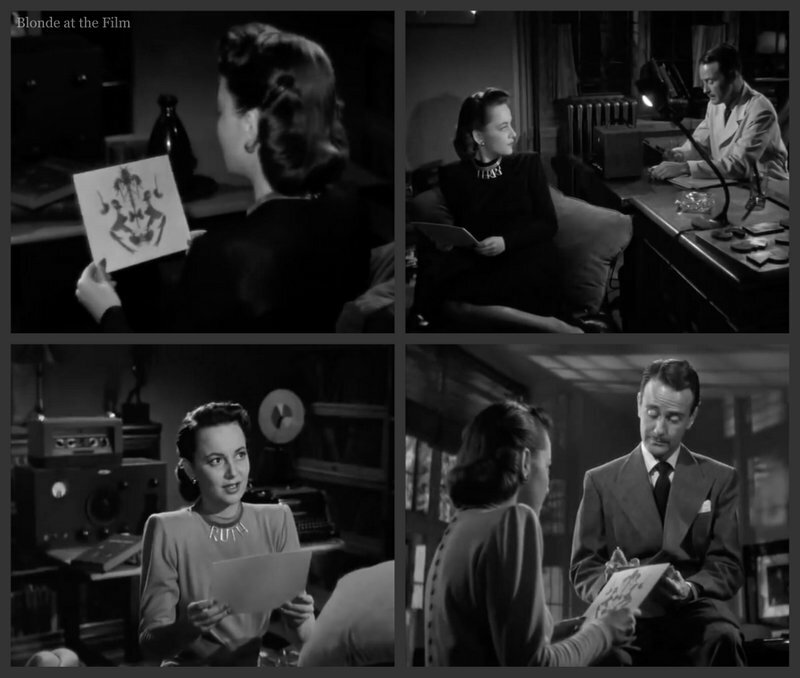 And in 1950, Olivia de Havilland reprised her role for a radio broadcast at Screen Director’s Playhouse. You can listen to that one here. Fun fact: In 1984, The Dark Mirror was remade as a TV movie entitled Dark Mirror starring Jane Seymour as the twin sisters and Stephen Collins as the doctor. Oh I’m so happy Blondie:) I love Olivia and this film! Do you like her in The Heiress? Hi Cameron, it’s bee n a while since I saw this one, but Olivia is great. She really made some good movies and was a lot more than Melanie, but always a lady. Absolutely! She made some great films. Hi! 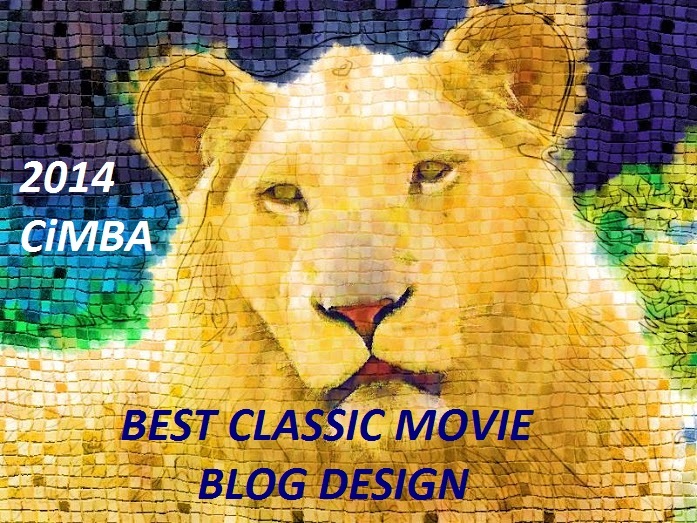 I’ve just discovered your fantastic blog! Love this film dearly since watching it many years ago. It’s one of Olivia’s finest performances and stands tall today. Thanks for a great review and look forward to reading more of your work. Best regards, Paul. Thank you, Paul! 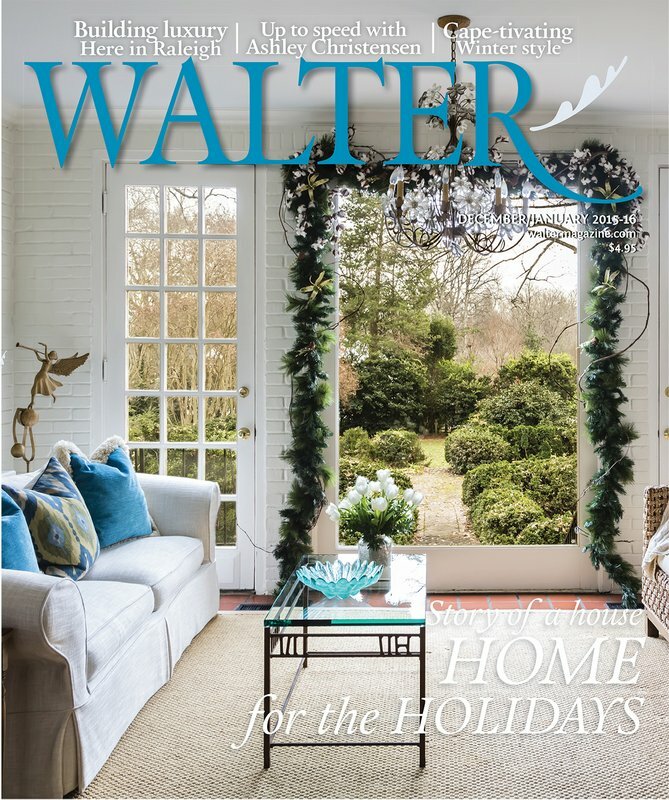 Hope you enjoy the blog! I remember being excited to watch this film. It is a good one but a bit predictable at times which ruined it a little. Olivia de Havilland does a great job indeed. Seeing her switch roles was fascinating. I agree! The dual roles are great.